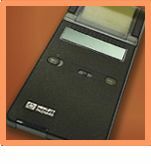 HP has discontinued this item but we have the ability to source difficult to find HP calculators and accessories. Please refer to our condition guide for questions about used and refurbished items and contact us if the condition you are looking for is not currently listed. We may have one that we haven't listed yet. Refurbished units when listed are fully tested and cleaned, and come with batteries and a roll of paper. Refurbished printers carry a 90-day warranty through Samson Cables. The battery-powered infrared printer is a revolutionary companion for your new calculator. Because it operates with an invisible infrared beam, no cord is necessary to connect it to the calculator. Producing hard copies in the field or in your office could not be easier. And this improved version offers easier-to-read output and automatic shutoff for extended battery life. Operation of the infrared printer is easy, too. Simply aim your calculator at the printer (from up to 18 inches away), send print instructions and you get a neat, clean copy of your calculations. You can print a complete record of your work, or select and print only what you need. Just four AA alkaline batteries give the infrared printer go-anywhere portability. Or to extend battery life, plug in the optional ac/dc adapter, purchased separately from us when in stock. Includes: Infrared printer, four AA alkaline batteries, and one roll of printer paper.